Nokia's Ovi Store day one: why aren't the best S60 apps being promoted? Why isn't Gravity being promoted? It’s day one of the Ovi Store, Nokia’s answer to the iPhone App Store, along with similar offerings from BlackBerry and Google. To say the roll out hasn’t been as smooth as the handset maker would have liked is an understatement to say the least. The service has been plagued by problems, such as really, and I mean really, slow load times, connection errors, the inability for some users to log-in using their existing Ovi account details, and applications disappearing and reappearing in the store itself. However, as time has passed, things are beginning to settle down. My own experience on my Nokia E71 is that the mobile client for the Ovi Store has steadily improved in performance throughout the day, and at the time of publication – approx 5pm London time – the service is certainly usable, if not as speedy as the iPhone’s App Store — yet. On the downside, I’m still unable to log-in to the Ovi Store on the desktop (Firefox running on a Mac) where I’m greeted each time with an error: “Sorry, you cannot sign in at this time. Try again later.” In its defense, Nokia says that it has been frantically adding additional servers to cope with “extraordinarily high spikes of traffic” — traffic that it surely should have anticipated. Teething issues aside, what about the store itself? It’s not terrible but it’s far from perfect either. I’ve no major problem with the user interface of the Ovi Store – here I’m referring solely to the on-device mobile client – although others aren’t so forgiving. Sure things could be tweaked, like making sub categories more obvious (see screen shot), instead I’m mostly disappointed by the editorial/business decisions taken on which applications to promote. While on the one hand I don’t want to see Nokia favor one developer over another, from a consumer point of view, the Ovi Store will live or die by its “killer” applications. Apple’s fond of saying in its ad campaign that on iPhone there’s an app for almost everything, but there are far fewer and very specific apps and supported services that the majority of users crave. 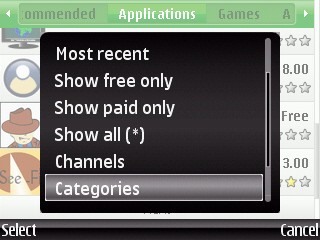 These should also be an app store’s flagship wares – the Ovi Store included. I won’t list them all here but social networking and Instant Messaging are two categories. Notable omissions here are multi IM clients on S60 such as Nimbuzz, along with the promised Facebook and MySpace apps, which likely weren’t ready in time for launch. 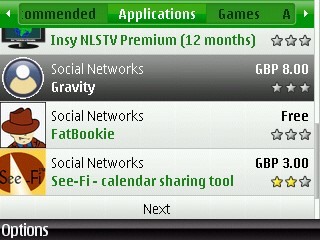 Another missed opportunity is Gravity, the best Twitter client for Nokia phones and one of the best apps per se, which although listed, is buried far down in the social networking sub-category. Also missing in action are Google’s offerings: the native S60 YouTube and Google Maps clients, along with the excellent Gmail java app. It’s not clear if these are missing because Google chose not to submit them to the store, even though all of the apps are free, or if Nokia doesn’t want to promote a perceived competitor. But either way, the handset maker should have worked something out. If you’re going to play the platform game, then you’re only as good as the applications and services that run on it.